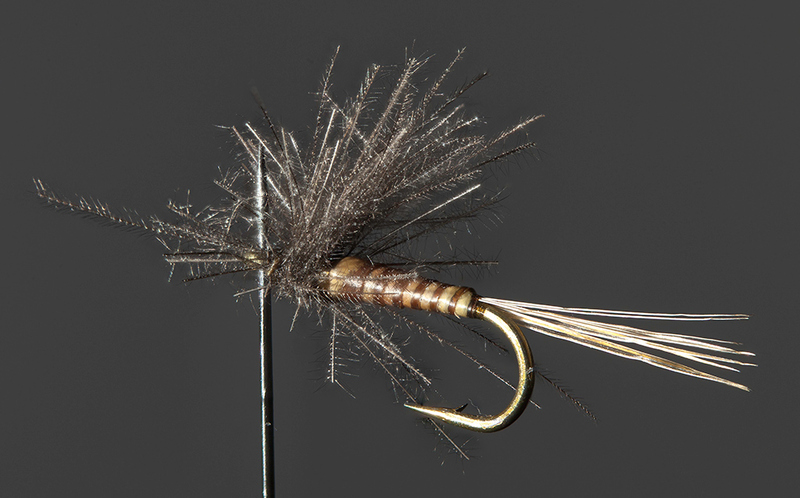 stevekale recently posted a Zerene editing issue regarding a fishing fly that he was trying to stack. The stack caught my attention and I inquired if I might get a copy of the original frames to play with. The stack turned out to be delightfully difficult to deal with, so I thought I'd share some of what I found. The basic problem here is that we have a brightly illuminated foreground structure seen against dark OOF background, with even darker focused background, the black feather. As the bright foreground goes out of focus, its brlght blur spreads across the background. This has two ill effects. First, the bright blur obscures whatever is in the background that we'd like to see. Second, because the edge of the spreading blur is fairly well defined, it appears to the stacking software to be "interesting" detail that's worthy of being preserved, and this tends to cause halos. As you can see, all of the automatic methods produce halos of one sort or another. In Helicon, there aren't any controls to specifically address those, so I'd probably attack with either retouching inside HF (tedious, since the affected region spans 14 source images) or by masking in Photoshop after saving out of Helicon. 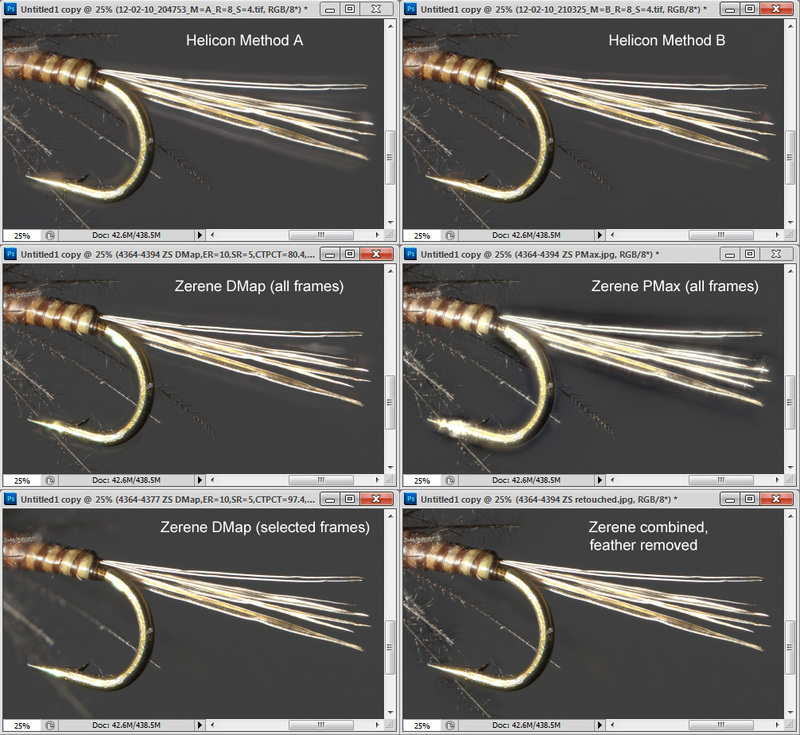 Zerene provides the DMap contrast selection slider, which is not completely effective when applied to a DMap of all the frames, but works quite well when applied to a selection of the 14 frames that show the hook and tail feathers in focus. Zerene's PMax works quite badly in this area, showing every one of PMax's classic artifacts --contrast increase, inversion halos, and introduction of starlike flare patterns -- plus a sort of false-detail artifact that was new to my list. I produced the final result shown at top of post by using Zerene retouching to combine several sources. The bright hook and tail feathers are mostly from a DMap of 14 frames selected and slider adjusted to give a clean rendition of that area. Most of the remaining area is from a PMax output, which did the best job with those heavily overlapping hackles. The vertical pin that holds the fly, and one bit of the hook, were most easily retouched from two individual source images. The remaining problem was that troublesome background feather that Steve asked about. I'm conflicted about the best way to handle that, so I'm showing you two approaches. The big image at the beginning is done with Zerene retouching, using a small brush to stroke over each bit of feather, and reaching as far into the bright blur as I could go without getting artifacts. The result looks pretty good at this scale, but when pixel-peeping I'm bothered by the remaining gap where there just isn't any visible detail to paint. I guess if I were so inclined, it wouldn't be hard to just clone in a reasonable facsimile using Photoshop, but I'm generally a "selectionist" rather than a painter. So the other option I'm showing here is to just get rid of that one feather altogether, using the simple expedient of not restoring it into the DMap'd area where it was naturally gone very OOF anyway. I think any of these approaches makes fine sense, and there are probably others that haven't occurred to me. Ah yes, one final thing...I promised to show you the Photoshop result. I have no idea why, but it botches the alignment, and from there on the situation is hopeless. I hope this is helpful. Many thanks to Steve for raising the issue to begin with, then letting me use his stack for this discussion. Thanks, Rik--for a very interesting post that I have returned to and re-read several times. Master-class material! . . .PMax's classic artifacts--contrast increase, inversion halos, and introduction of starlike flare patterns -- plus a sort of false-detail artifact that was new to my list. As a thought for a future post, I suspect many of us would benefit from advice on recognizing these artifacts. Obvious examples are pretty easy, but you surely see subtle instances that I (and perhaps others) would miss. Your experience gives you a wonderfully critical eye; I think most of us would like to be our own most severe critics, so anything you can do to bring the rest of us up to speed would be a help. Also, in the interest of efficient workflow, could this particular image have been shot in a way that would reduce the need to retouch? My sense is "yes"--but with a question mark. Maybe softer light, background with clearer contrast or color separation? Maybe rim lighting to give the subject's fine edges a pop? Changes like these might run against Steve's vision for the shot--and therefore be verboten in this case--but may be worth discussing in general. As someone with a large backlog of images in need of post production, I try to shoot images that will stack easily, if doing so doesn't interfere with the purpose of the shot. BTW, I've shot a fair number of fishing flies, as a friend of mine is a respected fly tier who does lectures and seminars. Since the desired output is PowerPoint and throughput has been important, I've optimized these shoots for digital-projector-quality (not wall-hanging prints) at reasonable speed. So--rather against my grain--I haven't stacked, but have used a standard macro lens stopped down enough to accept slight diffraction penalties. I've even--egad--cropped. A few of the smaller flies would have benefited from a bit of stacking, but not enough to be worth altering the workflow, as on the whole, the shots have been very workable for my friend's purposes. The key has been light control--get the lights such that the fishing fly separates from the background and the important details pop; the job is done in camera--nothing to do later. This is, of course, comparing apples to golf balls. You dissected a challenging stacking problem in a way that can lead us to better quality, and I'm arranging workflow to avoid stacking challenges for efficient throughput. Quite different. in the interest of efficient workflow, could this particular image have been shot in a way that would reduce the need to retouch? I've been struggling with this. There are a couple of different ways to think about the question, depending on how I interpret it. One interpretation is to take literally the words about "this particular image", that is, retaining exactly the lighting, background, and sharpness of the current stack. In that case, there's not a lot to play with except the lens choice and step size. In some cases using a small step size will help, but in this stack, I think the step size was already OK. Regarding the lens, anything that gives creamier bokeh both in front and in back of the focus plane tends to help with halos. That's because creamier bokeh will soften the edges of even those troublesome highlights as they go out of focus. It's better to have a round aperture than polygonal, because with a polygonal aperture the edges of some OOF blurs will stay relatively crisp instead of softening as quickly as we'd like. As you and I have discussed separately, I suspect that an "apodized" aperture would work even better, but that's definitely getting into custom optics. Another interpretation is less literal and allows to modify the lighting etc so as to get a result that is similar but not identical to what's shown here. Of course there's a lot more leeway in that interpretation. As a general rule, I'm tempted to joke that "Boring images tend to stack better than exciting ones, so anything that makes the image more boring will probably help." That may sound amusing, but there's some truth in it too. The biggest problem for stacking is halos, and the worst halos are caused by strong contrasts. Small bright highlights can wreak havoc -- see the discussion HERE for example. So, for automatic processing I recommend using the flattest lighting you can live with. For background, however, it's not always true that boring is better. Nothing could be more boring than a plain gray background, but a plain gray background is also a great invitation to halos. That's because stacking software is in the business of preserving detail. A plain gray background has no actual detail, so of course the software will happily replace it with whatever other bogus "detail" it can find. Typically that's the edge of an OOF highlight, and hey presto, there's a halo. Having some real detail in the background for the software to latch onto tends to keep those halos from happening. There are tradeoffs, though, and I don't know any way to predict for sure what will work best. The final issue that comes to mind relates closely to your comment about not stacking. We stackers are generally inclined to open up for best sharpness and treat all other issues as secondary. But there's a lot to be gained by stopping down. Shorter stacks are less vulnerable to artifacts such as contrast increase, transparent foreground, and certain kinds of halos, and if you do have to retouch or Stack Selected, those go faster too. If efficient automatic processing is a requirement, it's really best to consider the whole system including the intended final purpose, and someplace very near the beginning to consider how much sharpness you really need. Let that drive the choice of lens and settings, and work forward from there using the smallest aperture you can live with. I hope this helps -- it's a difficult question you've asked. Here's another take. This isn't my best trout fly stack but it's the one I found first. I put the fly on top of 1/8" inch thick white Plexiglass with a thin sheet of blue acetate below the Plexiglass. Put a slave flash underneath the plastic table with the flash intensity turned down to its lowest setting. Illuminate the bug with two umbrella strobes, sometimes with and sometimes without a light tent. Shoot at F8 which is the sweet spot for my Nikor 105mm macro lense, often but not always with extension rings. I use a StackShot focusing rail controlled by ZereneStacker. tethered to a linux desktop computer. This is just the default stacking method. I have yet to experiment with the D-method. I need to do that. Shoot in raw format. Edit one of the frames in the resulting stack with UFRAW and save a *.ppm file from UFRAW. Then use a batch processing command to apply the same edits to all other frames, converting to tif format on the fly. So now I have stack of unchanged original RAW format files plus a matching stack of edited tif files. Then stack the tif files with Zerene. Then use Gimp to edit the stacked tif. Edit as needed. Convert to a final jpeg. In other words I use Zerene twice: once to control StackShot and to make the stack. Then Zerene a second time to do the actual focus stacking. I'm old and have bad eyesight. So tethering the process to a large format HD monitor is a must for me. I can't focus well without tethering. I use entangle for the tethering. This photo shows an annoying reflection on the surface of the Plexiglass table. I have recently found I can get rid of those reflections by carefully sanding the Plexiglass table with 4000 grit silicon carbide sand paper. pittendrigh, thanks for this added example. In my experience, the key difference in your setup is that you have a dark subject against a light background. This is important because the contrast of dark blur against a light background is much lower than light blur against a dark background. That lower contrast for OOF blurs translates directly to less trouble with halo. Sanding the plexiglass is a good trick. Another approach to reduce reflections is to lay the subject on a piece of anti-reflection coated glass. High quality UV filters work well and are likely to be in your kit already. Another option is to buy a small piece of "Tru Vue Museum Glass" from eBay. I got a 5x7 inch piece for $16.